Most available books in chemical engineering mainly pertain to continuous processes, with batch distillation relegated to a small section. 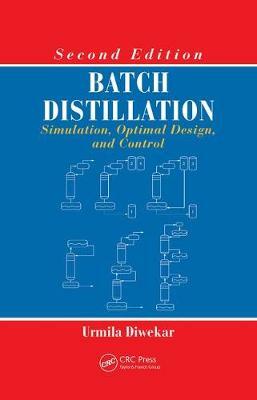 Filling this void in the chemical engineering literature, Batch Distillation: Simulation, Optimal Design, and Control, Second Edition helps readers gain a solid, hands-on background in batch processing. The second edition of this bestseller explores numerous new developments in batch distillation that have emerged since the publication of the first edition. This edition continues to explain how to effectively design, synthesize, and make operations decisions related to batch processes. Through careful treatments of uncertainty analysis, optimization, and optimal control methods, the author gives readers the necessary tools for making the best decisions in practice. While primarily designed for a graduate course in batch distillation, the text can also be used in undergraduate chemical engineering courses. In addition, researchers and academics faced with batch distillation research problems and practicing chemical engineers tackling problems in actual day-to-day operations will find the book to be a useful reference source.